New to the Isagenix range, these Dairy Free Shakes offer all of the same gut-busting benefits of traditional IsaLean Shakes but are completely dairy-free, making them an ideal muscle building or meal replacement solution for vegetarians and individuals with dairy allergies. What Are Isagenix Dairy Free Shakes All About? In a nutshell, Isagenix Dairy Free Shakes are low glycemic meal replacement shakes that satiate and deliver high-quality plant-based protein, filling fibre, good fats, and energy-boosting carbohydrates. Isagenix Dairy Free Shakes provide nutritionally complete pea and rice protein for lean muscle growth and maintenance. The all-new shakes also contain select good fats and carbohydrates to boost energy levels and provide your body with complete dairy-free nutrition. 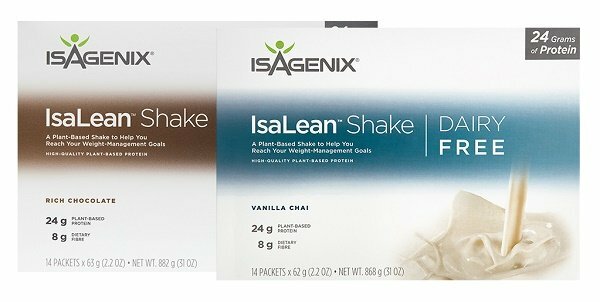 Isagenix Dairy Free Shakes are designed to support lean muscle growth and weight loss. With premium plant-based protein, 1045kJ of energy per serving, and a well-balanced nutritional profile, they provide your body with the nutrition it needs while keeping it fuller for longer. An Isagenix Dairy Free Shake truly is a complete vegetarian meal in a glass. Available in a delicious rich chocolate flavour, Isagenix Dairy Free Shakes taste great as well. Even though they’re packed full of dairy-free brown rice and pea protein, they taste remarkably good, making it easy to drink at least one a day in lieu of a meal and begin experience slimming results. With so much to offer, chances are these shakes will become the cornerstone of your Isagenix program. Build Lean Muscle – The high-quality protein utilised in Isagenix Dairy Free Shakes helps build and maintain lean muscles. Reach Weight-Loss Goals – With filling fibre and a low glycemic index, the shakes act as meal replacement mechanisms and support weight loss and management. Plant-Based Protein – Like their name suggests, Isagenix Dairy Free Shakes contain dairy-free plant-based protein ideal for vegans and health-conscious athletes. What’s in Isagenix Dairy Free Shakes? The Dairy Free Isagenix Shake contains 45.7 percent pea protein isolate and brown rice protein. A whole host of all-natural ingredients round out the shake and play key roles in its taste, consistency, and ability to support weight management. From natural Dutch cocoa powder and evaporated cane juice to chia seed powder and a robust fruit and vegetable blend, Isagenix Dairy Free Shakes utilise an array of healthy and tasty ingredients to create one of the best shake supplements on the market today. For more information, download the full list of ingredients here. What are the Ingredients in Isagenix Dairy Free Shakes? 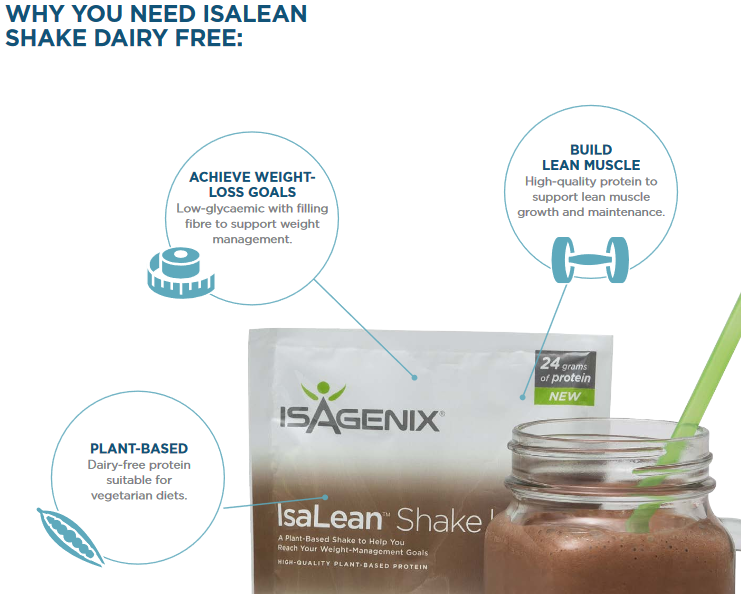 For more information about the dairy free IsaLean shakes or any of the other Isagenix products, contact Nicole at info@isaelite.com.au or call her on 0413 254 398. Alternatively, you can download the product information guide for the dairy free shakes here. How Can You Buy Isagenix Dairy-Free Shakes?